BELLEVILLE – Local health and law enforcement agencies are taking a proactive approach in the regional fight against a fentanyl-fuelled “crisis” of opioid misuse in Canada. Fentanyl – a potent painkiller at the centre of the country’s opioid abuse problem after its use claimed 655 lives from 2009 to 2014 – dominated talks at an Ottawa summit last week, when doctors urged the federal government to declare a public health emergency over the recent surge in opioid-related deaths. Fentanyl, which is up to 40 times more potent than heroin, is prescribed in a slow-release patch to people suffering from serious and chronic pain – but the contents of patch are being extracted, made into powder and added to illicit street drugs by traffickers, resulting in a sharp increase in overdose deaths. While powerful, black market variations of prescribed fentanyl haven’t turned up on the streets of Belleville yet, the prospect of its arrival – and the overall misuse of opioids – remains a concern. 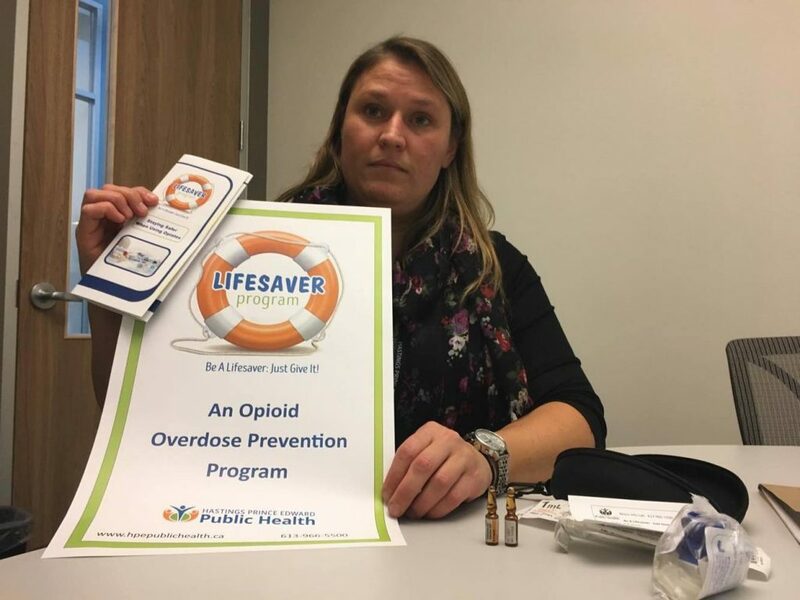 “We’re tackling a big problem and it needs big solutions,” Hastings Prince Edward Public Health program manager and director of the opioid harm reduction Lifesaver program Stephanie McFaul told QNet News. The program, launched in August, aims to inform users and non-users alike about the risks associated with opioids like fentanyl. By reaching out to community members, offering safety tips and distributing anti-overdose medication, McFaul said the campaign hopes to halt the national trend before deadly opioids enter Ontario – and Belleville. “It’s something we felt was important as we started to see a growing concern across the province with the issues around fentanyl. We thought ‘we need to take action’,'” McFaul said. As part of the campaign’s commitment to combating opioid-related deaths, Lifesaver provides a free injectable naloxone formula, which – coupled with professional medical attention – can reverse the effects of an overdose through at-home administration. According to McFaul, the accessible antidote, which will be replaced by an easy-to-use nasal spray in the new year, is an integral part of the program. Trace amounts of illicit fentanyl have been found in a number of other controlled substances across the country, including cocaine. To underscore the dangers of consuming recreational drugs “cut” with with imitation fentanyl, Hastings Prince Edward Public Health tapped into its client base while reaching out to area residents. “We’ve been actively advertising and reaching out to the population in both our community and the population of people who are using opiates through our needle exchange program to make them aware of the program and offer awareness,” McFaul said. Through close contact with participants of the health unit’s needle exchange program – which allows drug users to dispose of old needles in exchange for new and safe injection supplies at designated sites – McFaul added that the presence of synthetic fentanyl in the area, while unconfirmed, may be more prevalent than thought. The same could be true for Quinte West, OPP Const. Dave Ludington told QNet News, stating that a lack of drug seizures and confirmed cases doesn’t necessarily equal a fentanyl-free area. “I haven’t seen any or heard of any yet, but that doesn’t mean it isn’t happening,” he said. To prepare for the growing threat of fentanyl and counter the overall abuse of opioids locally, Ludington said awareness is key. “As an organization we’re working with outside agencies to educate our officers about what to do in case of an overdose,” Ludington said. Specifically, officers will learn how to properly handle toxic opioids, he said. In recent months, frontline responders have been hospitalized after coming in contact with potent opioid residue. Two salt grains worth of illicit fentanyl is enough to kill an adult. 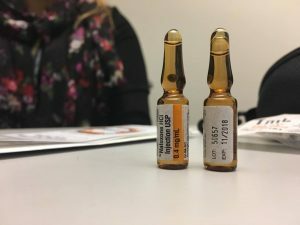 While local law enforcement and health agencies share anxieties over bootleg fentanyl’s introduction to the area, Addictions and Mental Health Services – Hastings Prince Edward senior clinical services manager Mary LaBine said she sees the emerging crisis as a continuation of a larger problem. “My concern would be that the consumption of prescribed opiates in Canada overall has been steadily rising, the form of which varies” she said. LaBine, who has watched the types of commonly-abused opioids evolve over her 25 year career – from Percocet to oxycodone – added that the rise of fentanyl use poses new, unprecedented risks. “There are overdose risks – it’s difficult for people who are misusing it to determine what their dose is, and with illicit substances, there’s an issue of not knowing what is in that dose,” she said. Looking ahead, LaBine said she isn’t convinced that further regulation from Ottawa would address the root causes of opioid dependency and abuse. “For addictions in general, one size doesn’t fit all. It’s not as easy as saying, ‘let’s ban fentanyl.’ We could try that approach, but I think we’ve seen with oxycodone that’s not necessarily very effective in eliminating the demand for opioids in our society,” LaBine said. In 2012, Purdue Pharma revamped its brand of oxycodone in Canada, releasing a tamper-resistant gel-based pill intended to curb abuse. As a result, many users turned to more accessible, harder drugs, and health and law enforcement officials cite the restriction as a catalyst in the current crisis. 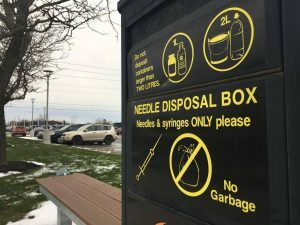 To date, Hastings Prince Edward Public Health has provided between 20 and 50 naloxone kits – part of a continued effort that Stephanie McFaul hopes will “offer opioid users a safe and trusted” link that, ultimately, saves lives.